A miracle in a time of miracles should not be a surprise and Chanukah is a time of miracles. Chanukah, the story of battles won, of Yehuda Macabee and his sons, but also the story of an oil lamp. It is written that the lamp shall remain lit without interruption before the place where the sacred Torah sleeps. When the oil for the lamp in the great Temple in Jerusalem was desecrated and the nearest supply was a journey of four days going and four days return, a great miracle happened in that place. The small lamp burned on without cease for the whole eight days. So what is this new Chanukah miracle to which I refer? It concerns a Chanukah menorah. Such a menorah with its nine branches-eight candles for the miraculous eight days and nights and one more to stand above the others as a leader-is usually a family treasure. The menorah of our story had been a family treasure for more than two hundred years. It grew from the hands of a great silversmith. It was commissioned and given as a wedding present by a wealthy man whose daughter was matched with the son of a well-respected rabbi. These two children-the bride was 14 and the groom had just entered his 17th year-received many treasures, but valued the silver Chanukah menorah from the bride's father and a pair of silver Sabbath candlesticks presented by adoring admirers of the groom's father, above all else. The Sabbath candlesticks remained with the bride until she departed from this earth. The Chanukah menorah brought light and joy to the household for eight winter nights every year until the couple's oldest son-himself soon to become a rabbi-was given the daughter of a rabbi as his wife. The menorah, polished until it shone like wisdom itself, stood on the table covered with gifts for the newlyweds. So it was that the menorah, revered by all who owned it, passed from parents to children or, as it is described in the Hebrew liturgy, l'dor v'dor-from generation to generation. The menorah was blessed by so many different voices and brought its light into many different homes. Once, during a cycle of pogroms with their ransacking, looting and burning, the menorah, along with several other valued items, was saved by being tied in a sack and lowered by rope into a well. Another time, the menorah was recovered from the unconscious body of a thief whose head had encountered a watchman's cudgel as he was climbing out a window with a bag full of loot. 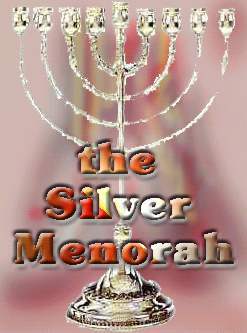 In that incident the menorah acquired a distinctive dent in its smooth, silver base. L'dor v'dor-from generation to generation the menorah traveled. In 1941, German troops, cheered on by their nazi leaders, ravaged a path across Europe. Avram, eldest son of Moshe, the chief rabbi of the shtetl that sprawled over one half of the town of Narodny, dug a deep hole at the base of an old tree and buried the menorah wrapped in a linen sheet. He went to tell his family where he had hidden the treasure. From the edge of the woods he watched as his father and mother and several of his neighbors were lined up and machine-gunned to death. He saw his brother, Micah, and his sister, Rachel, along with many other children, loaded into a truck and driven away. Avram, a partisan, a refugee, and a ghost of a dead world, lived in the woods. He ran and fought and hid. He starved, he was wounded and he was cold. He crossed forests and rivers. He crossed mountains and borders. He kept moving. When safety was near, he was denied safety. He was betrayed and several times came close to death or capture, but he escaped. He escaped and escaped and escaped. The war in Europe ended, but Avram's wandering went on. He entered the tumultuous territory that was soon to be born as the land of Israel. Again he fought. Again he was wounded; this time seriously enough to spend months in a hospital far from all battles. When he was healed he wandered again; this time to America. In America he settled down. He met a woman who had seen some of the horrors he had seen. Her heart knew some of the pain his heart knew. Before they married, Avram traveled once more to Europe. He wanted to give his bride a gift like no other in the whole world. He traveled by airplane and then by train and by bus until he came to the place where he had been born. Narodny was still there, but its name had been changed. The shtetl was no longer there, but what use is a shtetl when all the Jews are gone? The people who lived in the house that had once been so familiar to him watched suspiciously as he went to an old tree and started to dig. They did not try to dissuade him since he had a letter from the authorities. They feared the authorities. Besides, they were glad he had not asked them to explain the convoluted means by which what had once been his had become theirs. He dug until he saw rotted, tattered cloth. Then Avram reached down into the hole. He lay flat on the ground and scooped away earth with his hands. When he stood up again he was holding his treasure. The silver was black, but to him it glowed like nothing else he had ever seen. He clasped it to his chest and he cried. "Blessed one," he said in Hebrew, "ruler of the universe, we thank you for having carried us safely to this time." The Polish peasants who watched him didn't understand his words, but they could comprehend the situation. They awkwardly crossed themselves and muttered, "Praise God." Avram's bride wept when she saw the gift he had brought back with him. She had heard its story and she knew it meant his lost family and hers as well would be represented at their wedding. The story of the menorah does not end here. In some ways this was just another beginning. Avram and his wife had children. Their children became young adults. When their oldest daughter was about to marry, the menorah, polished to silver splendor, stood in the center of a table laden with gifts. After the ceremony at the synagogue and before the wedding supper was served, an elderly woman walked toward the gift table. She was the beloved friend and neighbor of the groom's mother. Her eyes were fixed on the menorah. Her steps became slower as she approached it. When she stood by the table, she lifted her bony arm. A blue, tattooed number glowed on her white skin. She put one thin finger in the dent on the menorah's base. Then she burst into tears and fainted. The father of the bride saw her fall and rushed to her side. He was leaning over her when she again opened her eyes. She stared up at him and in a voice that whispered as if it were afraid of its own words, she said, "Avram." Avram, whose American friends called him "Abe," had not heard that name in many years. He nodded as if in a trance. The whispering voice came again, "I am Rachel. I am your sister." They wept. All the guests wept. The angels wepts. One might say the young couple's life together was launched on a sea of joyous tears. Their journey was started with joy and illuminated for many years to come by the lights of a truly miraculous Chanukah menorah.